Plot. Income: 4. Initiative: 4. Claim: 1. Reserve: 7. Plot deck limit: 2. Each player may play events in his or her discard pile as if they were in his or her hand. Forced Reaction: After an event is placed in a discard pile, remove it from the game. 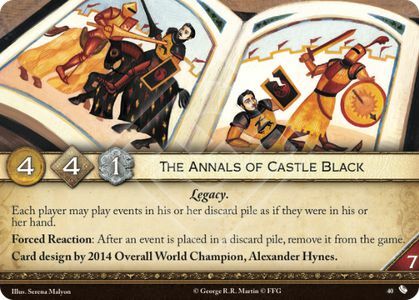 Card design by 2014 Overall World Champion, Alexander Hynes. Event cards played from the discard pile will be removed from the game (they are still considered to be placed in your discard pile after resolving).